Does the Kia Sportage seem like it’s exactly what your Jenkintown, Rydal, and Glenside area drives need? 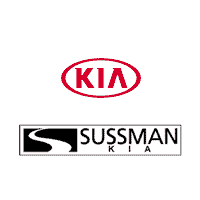 Sussman Kia has provided you with an up-close look at the kinds of things this dependable SUV can do. We’ll be covering a few of its distinguishing highlights in the areas of convenience, safety, and performance. Read on to begin your exploration of the 2019 Kia Sportage. There are several aspects of the 2019 Sportage that make the ride nice and smooth inside the cabin. One available feature that has the potential to help make this happen is the HomeLink®. This allows you to control elements of your home’s security from the vehicle, including the garage door, the security gate, and lights. The Sportage is also available with the Auto-Dimming Rearview Mirror with HomeLink® that keeps you from being distracted when bright lights are reflected from behind. Another way you’re kept safe from unnecessary distractions is with the standard Steering-Wheel-Mounted Audio and Hands-Free Phone Buttons. With these, you can turn the radio volume up and down, change channels, and even receive calls via Bluetooth® wireless technology. Looking to finance? Contact the experts in our finance center to get started today! 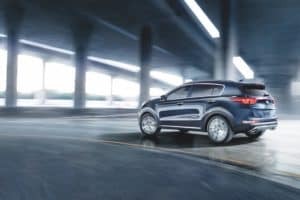 The safety features that you’ll encounter in the 2019 Kia Sportage provide you with an abundance of reassurance throughout the drive. An example of this is the Rollover Sensor. This standard feature is able to detect the likelihood of a rollover. When it does, it engages the seat-belt pretensioners and deploys the side-curtain airbags in order to prepare everyone onboard for impact. The Hill Start Assist Control (HAC) also comes standard in the 2019 Sportage. After being stopped on a hill, this feature helps you out when you’re ready to get going again by continuing to apply pressure to the brakes while you move your foot from the brake pedal to the accelerator. This action helps to make sure you’re heading in the right direction without inadvertently rolling the wrong way down the hill. There are two possible engines for the 2019 Kia Sportage. The one that comes standard is a 2.4L engine that has an output of up to 181 horsepower as well as 175 lb-ft of torque. A 2.0L Turbocharged engine is also available. This one is able to produce as much as 240 horsepower along with 260 lb-ft of torque. The Sportage is available with Dynamax™ All-Wheel Drive (AWD) system that improves its performance by increasing traction and control. The system accomplishes this with electronic sensors that monitor road conditions. When necessary, the appropriate power levels are distributed to the correct wheels for optimum effect. As you can see, the Sportage is one impressive SUV. 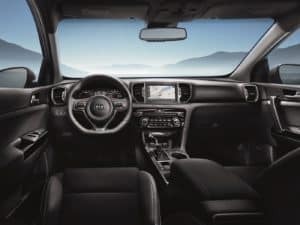 If you like what you’ve learned from this 2019 Kia Sportage Review and you’re interested in finding out what else it has to contribute to your regular commutes around Jenkintown, Rydal, Glenside, and beyond, contact Sussman Kia to set up a convenient time for you to take it out for a test drive.